Solution: A compound is found to contain 22.56% phosphorus and 77.46% chlorine by mass. 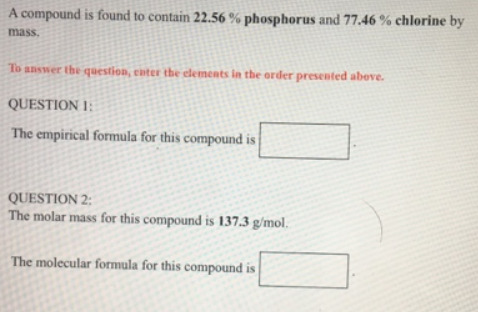 To answer the question, enter the elements in the order presented above.QUESTION 1The empirical formula for this compound is _____________ . QUESTION 2The molar mass for this compound is 137.3 g/mol. The molecular formula for this compound is _____________ . A compound is found to contain 22.56% phosphorus and 77.46% chlorine by mass. The empirical formula for this compound is _____________ . The molar mass for this compound is 137.3 g/mol. The molecular formula for this compound is _____________ .